Churches take March 21st as the Ecclesiastical Vernal Equinox in calculating the date of Easter. This page takes an astronomical look at the equinox and March 21st. The astronomical March equinox (northward equinox, spring equinox for the northern hemisphere) corresponds to the moment when Sun is at 0° ecliptic longitude, at which point the ecliptic intersects the celestial equator. Even for ancient astronomers the observation of the approximate day of the equinox would have been easy — an appropriate fixed structure is all that is required to assess the solar altitude at local apparent noon, or a structure oriented in an east-west direction for assessing the proximity of sunrise to due east or the proximity of sunset to due west. In the days of the Roman Empire, the word "equinox" had the literal Latin meaning "equal night", because the duration of daytime and night time are approximately equal on the date of an equinox. Due to atmospheric refraction, however, when Sun is near either horizon it always appears to be at a higher apparent altitude than its true geocentric position, so daytime at an astronomical equinox is always longer than night time. For example, on the date of the March 2005 equinox in Jerusalem, the duration of the night was 11 hours and 44 minutes, whereas the duration of the day was 12 hours and 16 minutes, so that day was 32 minutes longer than the night. The actual date of equal day and night was March 12th, or 8 days before the astronomical March equinox. On the date of the astronomical September 2005 equinox in Jerusalem the duration of the day was 12 hours and 17 minutes, whereas the duration of the night was 11 hours and 42 minutes (this doesn't add up to exactly 24 hours because the seconds were rounded as they are insignificant and because it is already changing for the next day). That day was 35 minutes longer than the night. The actual date of equal day and night in Jerusalem in the autumn of 2005 was October 1st, or 8 days after the astronomical September equinox (southward equinox, autumnal equinox for the northern hemisphere). The number of days that separate the equinoxes from the date of equal daytime and night time varies with latitude, with the least separation at higher latitudes where the length of the day changes more rapidly in the vicinity of the equinoxes. For example, in Toronto the equal day and night occurs about 5 days before the March equinox and 4–5 days after the September equinox. Saying that the day and night are equal is the same as saying that the daytime temporal hour, calculated as (sunset – sunrise) / 12, is exactly 60 minutes. It is patently absurd to propose that the Church selected March 21st as the date of equal duration of day and night, because that introduces a discrepancy of more than a week regardless of whether one is speaking of Jerusalem, Alexandria, Vatican City, Nicaea or nearby Constantinople (today known as Istanbul). The Babylonian Talmud (tractate Eruvin, page 56a) defined the equinox as the day on which Sun rises from the true east direction and sets to the true west direction (these are not the same as the directions shown by a magnetic compass, because the magnetic poles wander relative to the global axial poles). In modern astronomical terminology we would describe that as the day when the sunrise azimuth is 90° east of north or when the sunset azimuth is 90° west of north. True east was defined in Eruvin as the horizon mid-point between the furthest north-east sunrise on the day of the north solstice (summer solstice for the northern hemisphere) and the furthest south-east sunrise on the day of the south solstice (winter solstice for the northern hemisphere). True west was defined in Eruvin as the horizon mid-point between the furthest north-west sunset on the day of the north solstice and the furthest south-west sunset on the day of the south solstice. This definition is astronomically valid for all inhabited non-polar locales on planet Earth, but only within plus or minus a day or so because Sun rises exactly from true east only when the equinox moment occurs at sunrise for the observer's locale, and Sun sets exactly to true west only when the equinox moment occurs at sunset for the observer's locale, and because of errors due to the elevation of the locale as well as variations in atmospheric light refraction at the horizons. Rather than requiring the sunrise to be exactly from true east or sunset exactly to true west, which is unlikely unless an equinox moment occurs exactly at sunrise or sunset for that locale, one could define the northward equinox as the first day when the sunrise azimuth is less than 90° east of north, or as the first day when the sunset azimuth is less than 90° west of north, at some specified location. The Hebrew calendar always begins calendar days at sunset, therefore the sunset azimuth is of observationally greater interest than the sunrise azimuth. Very possibly the early Christians, having had their origins in Judaism, also regarded days as starting at sunset. The modern practise of regarding civil time as starting at mean solar midnight is a relatively recent innovation, since the invention of mechanical clocks. March 20 March 21 0° 0' 15"
Many religious as well as secular and even scientific sources regard the equinoxes and solstices as marking the beginning of the seasons, but astronomically, in terms of the insolation of solar energy, they actually mark the middle of their respective seasons (the Chinese got this right for the major solar terms of their traditional lunisolar calendar). Surface temperatures depend on the balance between solar insolation and the passive radiation of energy from Earth into space. During winter, radiative losses are increased by reflection from cloud cover and from surface snow and ice. In Rome, surface weather seasons lag behind their corresponding astronomical seasons by about 3+1/2 weeks. The astronomical spring season begins 1/2 season or about 6+1/2 weeks before the spring equinox. Thus the spring weather season begins (6+1/2) – (3+1/2) = about 3 weeks before the spring equinox, which is the beginning of the month of March. Arranging the calendar so that the spring equinox lands on March 21st causes the entire month of March to fall within the spring weather season in Rome. Could it be that the historical "theft" of a day and later another day from February was actually an early attempt to compensate for the equinox drifting earlier in March on the Julian calendar? 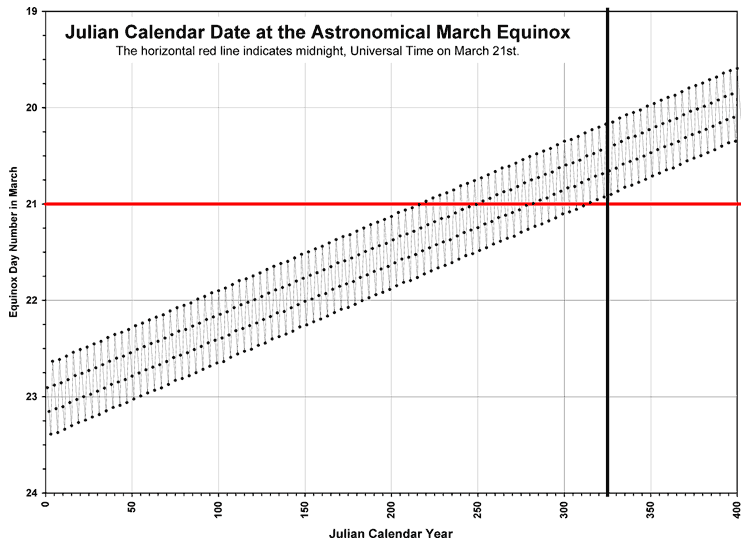 To compute the alignment of the astronomical March equinox on the Julian and Gregorian calendars, and to prepare the collection of charts offered in the table below, I used the calendrical calculation functions and astronomical algorithms described in "Calendrical Calculations" by Nachum Dershowitz and Edward M. Reingold, third edition published in 2008 by Cambridge University Press. I also employed some algorithms from "Astronomical Algorithms" by Jean Meeus, second edition, published in 1998 by Willmann-Bell, Richmond, Virginia, USA. Since neither of these books details the arithmetic for the revised Julian calendar, I used my own implementation (thanks to crucial help from Robert Harry van Gent of The Netherlands). For each chart you may click on the thumbnail image to view it as a PNG (Portable Network Graphics image) your web browser, or click on the PDF icon to view a higher-quality image of the chart using a PDF reader such as the freely available Adobe Acrobat Reader. The PDF files are larger because they include a second page that covers a much longer term (to year 2800 AD for Julian, and to year 8500 AD for the Gregorian and revised Julian calendars). On the following charts each astronomical March equinox moment is expressed in Universal Time (UT, the meridian of Greenwich, England). To convert UT to the mean solar time of Alexandria, Egypt (about 30° E) add 2 hours to the UT moment. For the mean solar time of Jerusalem, Israel (about 35° E) add 2 hours and 21 minutes to the UT equinox moment. For the mean solar time of Washington DC (77° W, the American Prime Meridian) subtract 5 hours and 8 minutes from the UT equinox moment. The moments of the March equinox on the Julian calendar for the years 1 to 400 AD (in the PDF up to 2800 AD). For most of the 4th century and certainly from around the year of the Council of Nicaea in 325 AD and thereafter the equinox moment landed on March 20th. This graph is plotted in Universal Time for the Prime Meridian. If it were in terms of Alexandria mean solar time then the points would be 2 hours later. If the early Christians regarded days as starting at sunset then the points would be another 5+3/4 hours later, because sunset in Alexandria around the time of the equinox is about 5+3/4 hours before midnight. That would place about half of the equinox moments of the decade prior to 325 AD on March 21st. The mean year of the Julian calendar is 365+1/4 days = 365 days and 6 hours, or approximately 11 minutes per year longer than the present-day northward equinoctial year. Soon after 325 AD the equinox landed no later than March 20th and has advanced earlier on the Julian calendar ever since. During the present century, shown on the second page of the PDF, most of the equinox moments will land on March 7th. Note that in the first year after the Julian calendar epoch the equinox was on March 23rd. 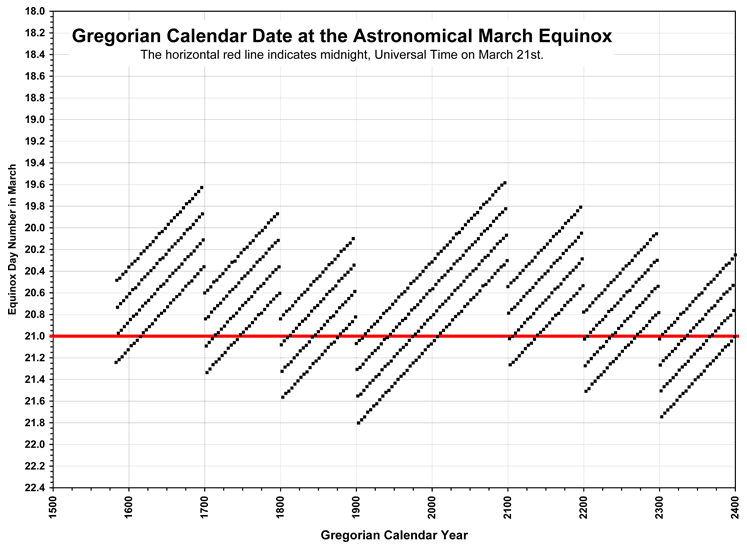 The moments of the March equinox on the Gregorian calendar for the years 1583 to 2400 AD (in the PDF up to 8500 AD). The graphically depicted "jitter" range of the Gregorian leap cycle, relative to the mean northward equinox, spans 2.1975 = 2 + 79/400 days. The jitter range of a smoothly spread 400-year leap day cycle would be 399/400 of a day, so the excess equinox jitter due to the unsmooth spread of Gregorian leap years amounts to 1.2 = 1 + 1/5 days. For most of this time, with the exception of about half of the equinoxes of the 20th century, the equinox moment lands on March 20th. The chart suggests that March 21st was selected as the first day after the equinox, or, as Protestants since John Dee have asserted, that a 10-day correction was applied to the Julian calendar when actually an 11-day correction was required. The mean year of the Gregorian calendar, 365+97/400 days, is slightly too long, so in future millennia the equinox will drift to earlier dates. The accuracy of the Gregorian calendar mean year was limited by the sexigesimal numeric notation that was used in the era of the Gregorian reform. The mean spring equinoctial year was expressed to the nearest 1/3600 of a day as 365+14/60+33/3600 days ≡ 365+97/400 days, which is exactly 3/400 ≡ 27/3600 of a day shorter than the Julian calendar mean year. Each 1/3600 of a day is 24 seconds. Deducting a further 1/3600 of a day yields the mean year of the Revised Julian calendar, discussed in the last row, below. The future accelerated drift of the equinox towards earlier dates in March will commence when Earth's orbital perihelion appoaches the March Equinox, as explained on my web page: "The Lengths of the Seasons". By constraining the equinox to land on March 21st, the Gregorian Reform implicitly shifted the epoch of the proleptic Gregorian calendar two days later than the Julian calendar, as it was pointed out above that in the first year after the Julian calendar epoch the equinox was on March 23rd. The proleptic Gregorian calendar dates were the same as the Julian calendar from March 1st, 200 AD until February 28th, 300 AD. The years 200 and 300 AD were Julian leap years but not Gregorian leap years. As a consequence, as tabulated above, in 325 AD the northward equinox in Alexandria (or Jerusalem, whose mean solar time is only 21m 4s ahead) landed within a few minutes of noon on March 21st of the proleptic Gregorian calendar. The moments of the March equinox on the Dee calendar for the years 1600 to 3600 AD, reckoned for the meridian of 77°W longitude = Washington, DC, which John Dee called "God's Longitude". With a leap cycle of 33 years and 8 leap days per cycle the Dee calendar mean year is 365+8/33 days = 365 days 5 hours 49 minutes 5+5/11 seconds = 365.24... days. Having a shorter mean year than the Gregorian calendar, and an epoch that was one day earlier, the equinox landed exactly on March 21st in the 17th century, when reckoned for 77°W longitude (an American "Prime Meridian"). The medium-term equinox "jitter" range is substantially less than the Gregorian calendar, in fact it equals the minimum that is possible for a leap day calendar, because the leap years of the Dee calendar are inherently distributed at intervals that are as smoothly spread as possible (seven 4-year intervals and one 5-year interval per 33-year cycle). 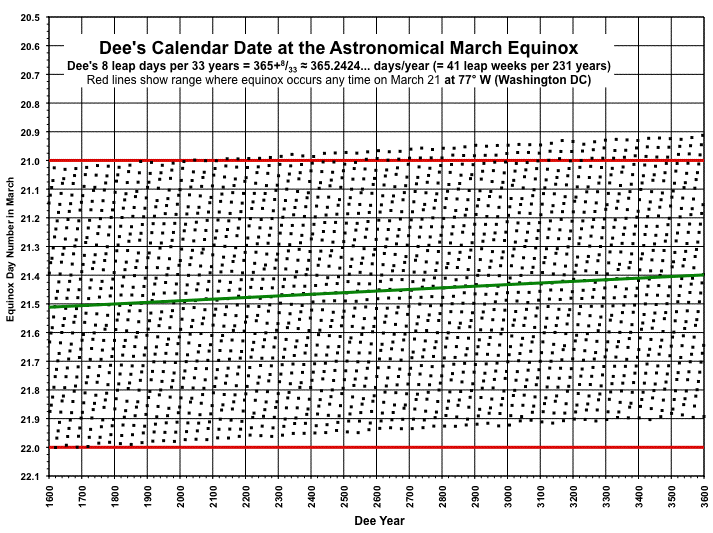 The future equinox drift rate of the Dee calendar will be less than half that of the Gregorian calendar. The moments of the March equinox on the Revised Julian calendar (otherwise known as the "New Orthodox Calendar") for the years 1900 to 2400 AD (in the PDF up to 8500 AD). 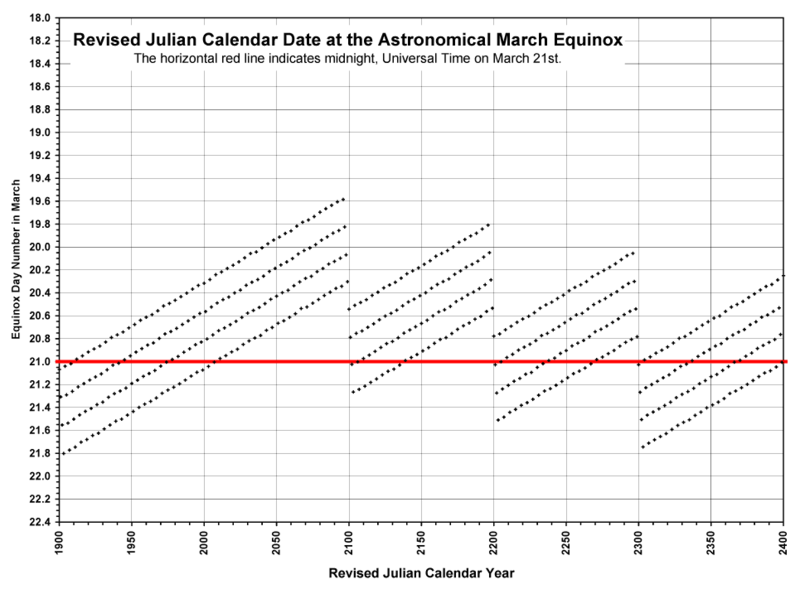 The graphically depicted "jitter" range of the Revised Julian leap cycle, relative to the mean northward equinox, spans 2.362... = 2 + 163/450 days. The jitter range of a smoothly spread 450-year leap day cycle would be 449/450 of a day, so the excess equinox jitter due to the unsmooth spread of Revised Julian leap years amounts to 1.364... = 1 + 82/225 days. For most of this time the equinox moment, in terms of Universal Time at the Prime Meridian, will land on March 20th. Again, it is highly improbable that the group of astronomers and mathematicians who recommended this calendar reform to the All-Orthodox Conference of 1923 in Constantinople, lead by the great Serbian astronomer, Milutin Milankovitch, could have erred significantly in predicting the date of the equinox, so it seems as if March 21st was selected as the first day after the equinox, or they simply forced their calendar reform to agree with the Gregorian calendar in the 20th century. The mean year of the revised Julian calendar, 365+109/450 days, is slightly too short, but as a consequence of the future shortening of the astronomical northward equinoctial year the revised Julian calendar will retain relatively good equinox alignment to beyond the year 8000 AD. By constraining the equinox to land on March 21st, the Orthodox Churches made the revised Julian calendar match the Gregorian calendar in the 20th century, implicitly shifting the proleptic revised Julian calendar epoch two days later than the Julian calendar epoch. The Gregorian and revised Julian calendars will have identical dates until March 1st, 2800 (because 2800 will be a Gregorian leap year but will not be a revised Julian leap year). In non-leap years on the Julian, Gregorian, and revised Julian calendars, March 21st is day number 80, counting January 1 as day number 1, so 79 days elapse prior to March 21st. In leap years March 21st is day number 81, with 80 prior days elapsed. In the present era the March equinox on the Gregorian and revised Julian calendars, referred to Universal Time at the Prime Meridian, lands on the 79th day.